Snowmobiling in Idaho was not on my bucket list, but it should have been. Being a skier, I know I should have been cross-country skiing peacefully through the glorious pines of the Idaho Panhandle National Forest near Silver Mountain Ski Resort. But it was way more fun to be on a Polaris sled screaming along groomed snow trails, covering 40 miles (that would have been a lot of Nordic skiing) with spectacular views of the Coeur D’Alene River, and the Silver Valley. 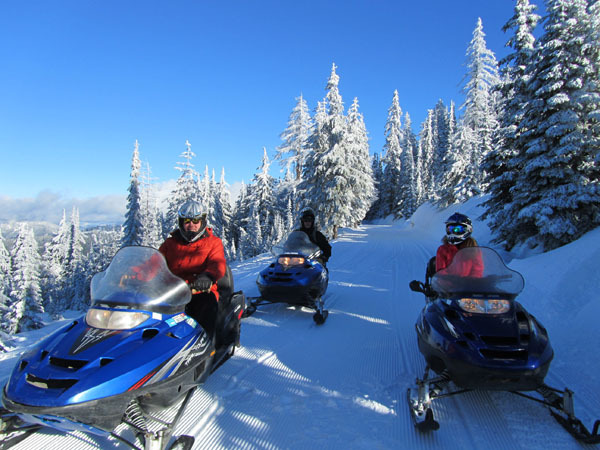 See our Idaho Snowmobiling Photos. An afternoon tour with Adventure Sports Rentals made for great afternoon adventure during our Idaho ski trip. First, it’s a great way to explore Idaho’s backcountry, a snow globe of 700 miles of trails – with a guide and well-kept well-powered 2-stroke snowmobiles. Second, it’s beautiful, jaw dropping scenery around each turn, from frost coated forests to scenic overlooks of the valleys. We saw a moose thrashing around in the trees, cougar tracks and a bird’s eye view of Silver Mountain where we had skied the day prior. And finally, snowmobiling in Idaho is a rush. On one straightaway we went full throttle, I looked down ever so quickly to see 70mph on my sled’s speedometer. Riding is technical like skiing (weighting your turns, accelerating, anticipating), while providing a super scenic adventure. Our guide Yogi was helpful in giving pointers on proper riding technique for those of us who aren’t experienced snowmobilers, okay me. I recognize the hypocrisy that a snowmobile brings you to beautiful wilderness settings, but makes a lot of noise and fumes in the process. So it’s a once in a lifetime (ok, maybe twice) indulgence. If you get the chance to snowmobile in northern Idaho, go. Its a great adventure as part of ski trip to Silver Mountain and Schweitzer Mountain Resort.